If there’s one thing Dogfish Head is known for it’s making unique limited release beers. President and founder Sam Calagione is always on a quest for new ingredients to add to his ever-expanding line of off-centered ales. 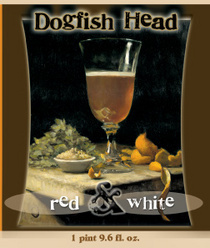 Although RED & WHITE isn’t as “out there” as some of the stuff they produce, it is definitely not your typical beer. Red & White is a Belgian-style Witbier with a practically non-existent 35 IBUs and an ABV that floats between beer and wine at 10%.